Hang out on AIRHEAD’s COOL ISLAND and have a party! Suntan on the roomy sundeck, then cool off splashing around in the mesh area. Four drink holders and a sundry holder, perfect for storing suntan lotion, are conveniently located between the wet and dry areas. The boarding platform makes it easy to climb on top from deep water. There are 3 handles welded to the sides for carrying. Two tie down points are strategically welded to the sides for anchoring. Designed for up to 6 adults. Dimensions: 107 in. x 88 in. (deflated). WaterWedgie™ is the number one name in Water Sports and now offers fast shipping to the US and Canada. 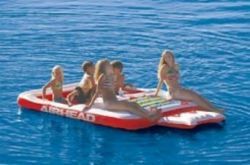 Water Toys, Boats, Tubes, Towables, Inflatables, Floats, Rafts, Lounges, Trampolines, Skis, Life jackets and more all on Sale at the Best Price Period! If you find it here, it will be on Sale. SportsStuff and AirHead water tubes & towables. Boating supplies and boating accessories, sportsstuff doables, trolling motors and Free shipping may be available on select products. Browse our water sports online catalog or visit any one of our new locations. WaterWedgie Sporting Goods for all your boating and watersports needs.